During the '60's the car manufacturers did a lot to promote their cars through drag racing including building limited edition drag cars. I think some of the coolest factory drag cars every made were the Mopars built to run Super Stock. In 1964 both Plymouth and Dodge got in on the act and offered their new Hemi engine to drag racers in lightened packages designated with the code A-864. 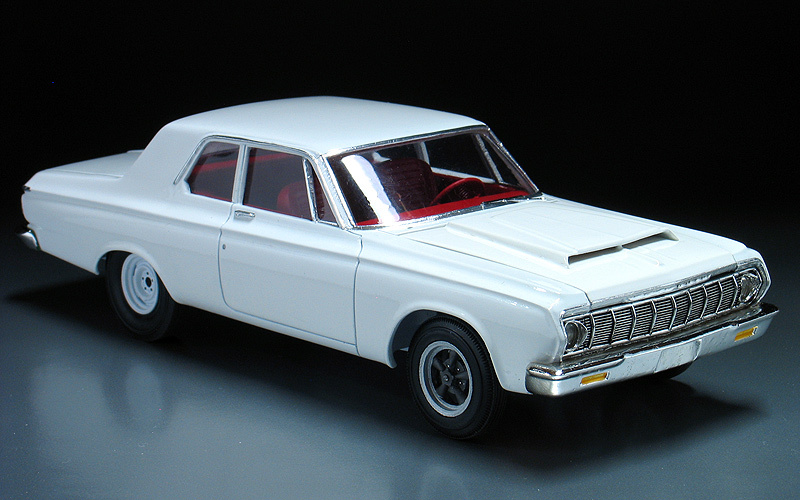 I've been sitting on a collection of resin kits with the intent to build replicas of this car and it's sister '64 Dodge for a number of years. 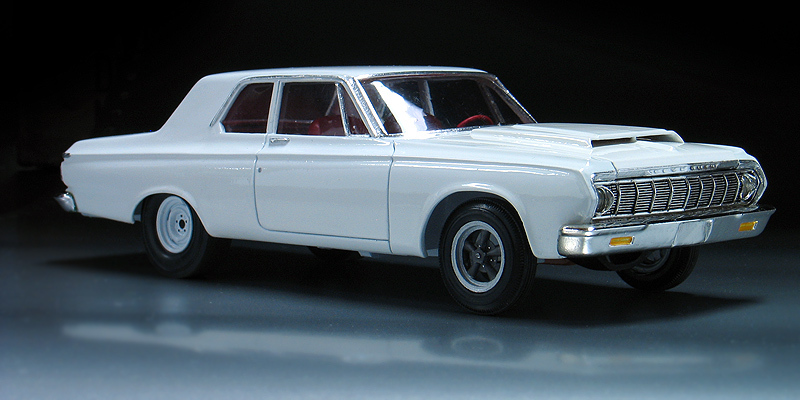 In fact I have had this '64 Plymouth Savoy kit and a '64 Dodge 330 kit unbuilt in my stash for more than 20 years. I figured I wasn't getting any younger so I thought I would start building these. 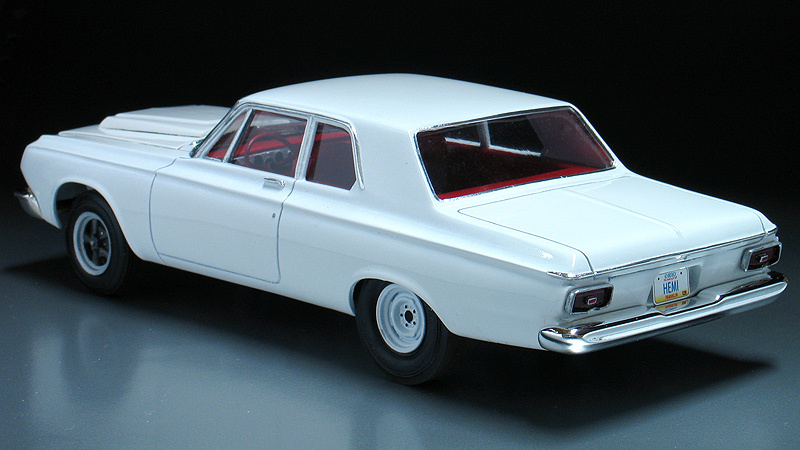 This particular 1/25th scale resin conversion kit is from R&R Vacuum Craft. It included the post window sedan body, the hemi hood scoop, a single headlight grill, two D-100 van seats and taillights. 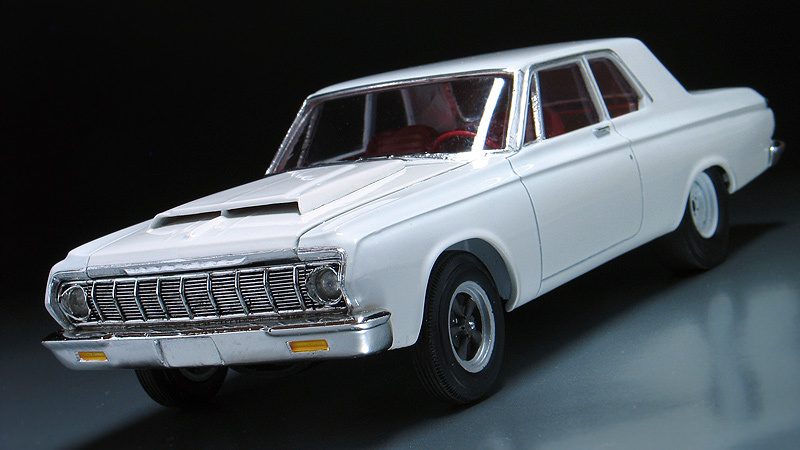 The body itself appears to have been converted from a Johan '64 Plymouth Fury and requires one of those kits to complete the model. In general the R&R Vacuum Kit was well done, but did require filling some pin holes and grinding out the window areas. 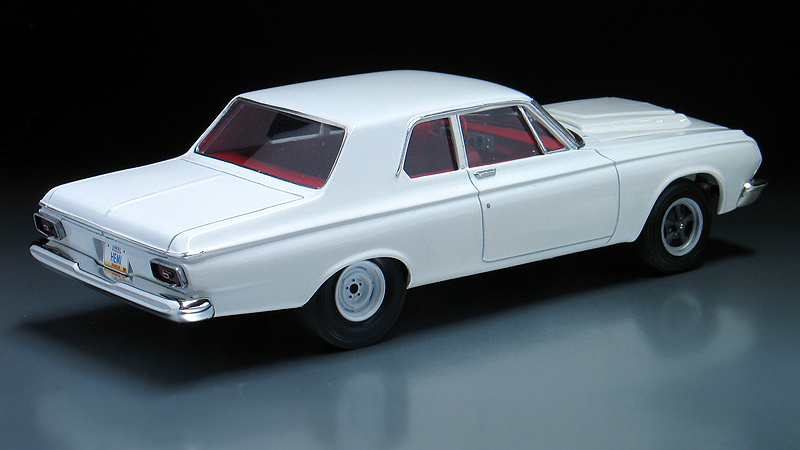 After prepping the body it was shot with Tamiya gloss white and then covered with PPG urethane clear. The donor '64 Fury kit I used was previously built and supplied the interior bucket, engine, chassis, front windshield and rear bumper. Since the chrome was old on my rear bumper I sanded off the mold lines and sent it to Chrome-Tech who replated it. Getting the correct wheels for this model proved to be a chore and was one of the stumbling blocks that seemed to hold me up from building it. The real cars had special 15x4 magnesium Torque Thrust front wheels with a large diameter hub section. There have been a ton of kits over the years that had Torque Thrust wheels in their boxes, but I had never seen a set that had just the right details and proportion. Finally, I stumbled across somebody selling a resin set on ebay a few years back and I snapped them up. I have no idea who made them originally and haven't seen any since. Since they were so hard to come by I decided to make a mold of the ones I had so I could cast more for other projects. The rear mopar factory steel wheels are from a Johan '68 Chrysler kit. Again these are super hard to come by so I made a mold and cast my own duplicates of these too. Tires for both the front and rear wheels came from my parts box. I made all the windows from thin sheet clear acrylic. The rest of the model features simple curbside detailing. It's just a simple shelf piece but I think it looks convincing real. Now where's my unbuilt '64 Dodge kit at?